Memories of my childhood make me smile, laugh, cry, cringe, regret, regress, and reflect. There was someone in Jr. High who bullied me, and during that time I was a tornado of negative emotions with no real understanding of why it was happening. A classmate of mine, Michael Anthony (who you have read about before For Billy: The Movie) made it his goal to show people who have had a bullying experience that we are not alone. anthology of anonymoUS (The Book): A powerful collection of 99 responses to the question: “What is it that bullies you?” This book is a unique look into raw, uncensored truths, experiences, and emotions that will amaze you. Each story, poem, email, confession is different, yet we can all relate. Michael Anthony inspired these anonymoUS authors to band together and show us all “Even in our darkest moments, we are never alone.” Order your copy of this book today! 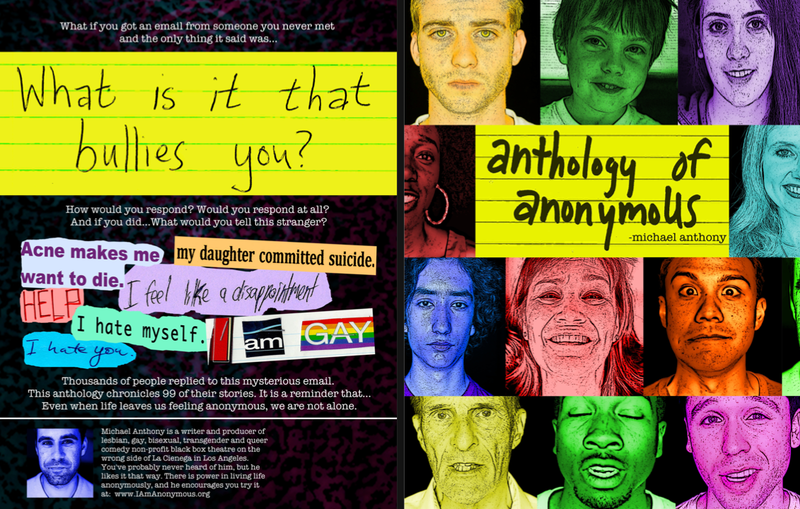 For each copy of the “anthology of anonymoUS” that is purchased through this site (www.iamanonymous.org), $1 will be donated to an anti-bullying program that operates within the delivery zip code. It is extremely important to consider that by referring this book to your friends, parents, grandparents, cousins, uncles, aunts, teachers you could be helping someone going through a difficult time. anonymUSe (The Music): “An 18-track musical collection that explores our inner bullies through an eclectic mix of folk, jazz, new age, R& B, spoken word and dance music.” Anthony asked a group of talented musicians to respond in song to a variety of the anonymoUS written pieces. Beautiful music has been created to release and re-illustrate the pain someone has once gone through (if this isn’t Karma for the bullying, I don’t what is!) The pain someone has felt, has now been turned into a candid,amazing song. This is also one of the first non-profits EVER to release a soundtrack along with its book. Show your support to these artists by ordering your soundtrack today and be sure to get a listen preview at the anonymoUSe site. Let’s face it, we know Michael Anthony is not stopping with a book and a CD. The anonymoUS initiative isn’t even CLOSE to being done yet. Plans for a play and workshops are also in the mix, so keep visiting http://www.iamanonymous.org for more information, updates and news. I also recommend you follow Michael Anthony on Facebook, or YouTube. Since I could not word it better myself (to describe the incredible achievements and drive this man has), I will end this blog with more information on Michael Anthony and why he is making my generation PROUD! Michael Anthony Nalepa is a Wheeling, Illinois native who now works as a professional writer and producer in Los Angeles. His work has been featured in Glamour, The Advocate, Reader’s Digest, TV Guide and TMZ, as well as on NBC, Country Music Television, Sirius Radio and TV Guide Network. For four years, he served as Creative Director of Alternative Programming for the Celebration Theatre and now hosts and his own award-winning theatrical variety hour at Lilly Tomlin’s LAGLC theatre in Hollywood. His work as an equal rights activist launched the “anonymoUS initiative”, an international letter writing campaign dedicated to helping people of all ages, races and orientations overcome what bullies them through art and activism. An anti-bullying documentary based on Michael’s childhood in Wheeling, IL is slated for national release in 2013.